What with all the excitement of my holiday on Monday I have to admit that I haven’t had a chance to sit down and write. Which is annoying because I really like writing! And I won’t get to write properly until after my trip. I hope I can survive (and satisfy you guys) with just lots and lots and lots of photos. Here’s hoping! I won’t lie: it was pretty damn grim to see the whale’s coroner knee-deep in whale bits (there’s no other word or words that can suitably describe the pink, wobbly mass she was wading through). ‘If I can just reach a little bit further up here into this cavity I can free its heart, but it’s tied down by all of these blood vessels…’ She’s hacking away with a machete! Chopping away at a dead whale! The heart of this leviathan is a cubic meter! The main scientist (the one with the sharpest knife) held up a segment of its aorta (the main output artery of the heart) and it was about the size of your head! And its heart only beats three times a minute! (Which is how it stays underwater for so long.) 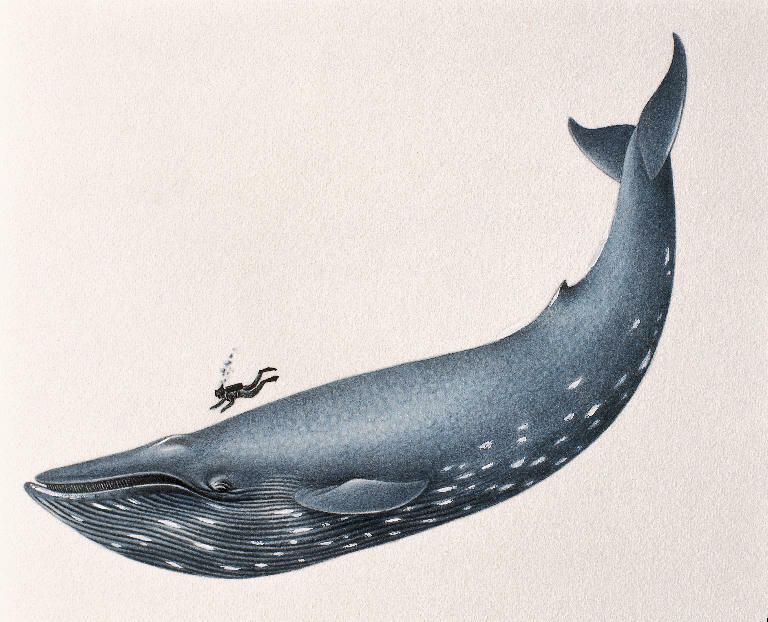 The whole whale weighs 60 tons (55,000kg) and is 65 feet (20m) long! When feeding it swallows 70 cubic meters (18,000 gallons) of water and then spits it back out through its filters, capturing fish and crustaceans. It can empty and fill its 3000-litre lungs in one breath — which it only needs to do once every 40 minutes! But the amazing bit? They’re mammals, just like you and I! They originally started off as dog-like creatures with hoofed feet. 53 million years ago these ‘pakicetids’ jumped into the water and never looked back. It took 15 million years for them to lose their legs and become fully marine. 8 million years more and they had learnt to echolocate (the ‘sonar’ that they use to locate food and obstacles). 10 million years later they diversified into dolphins and porpoises — and that’s where we are today. 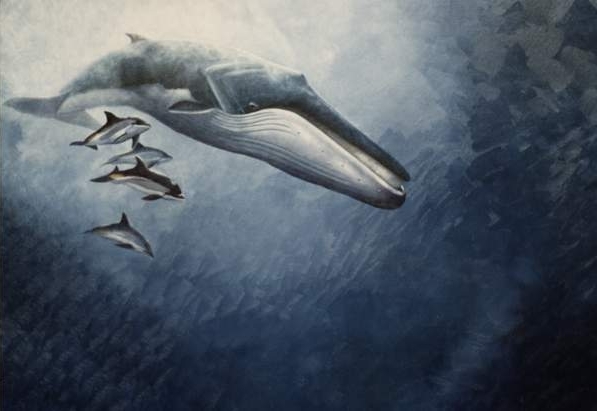 ‘Just’ 53 million years to mutate from average-sized land-dwelling mammal to the largest species this planet has ever known — the Blue Whale (which are bigger than commercial jets, by the way). Their new-born children weigh 6,000lbs (2,700kg) and drink 400 litres of milk a day! But as weird and foreign and huge as they are, they’re still mammals. These monsters are genetically more similar to a mouse than a fish. And that made me think about where we’d be in 53 million years. Humans are incredibly young in the grand scale of things. We — Homo habilis, our very, very primitive ancestors — started using tools around 2.5 million years ago, which set us apart from our chimpanzee brethren. And look how far (or not?) we’ve come in just 2.5 million years! In another 51.5 million years what could we possibly evolve into? I’ve talked a tiny bit about the future of the human race but hardly touched on the topic of evolution.Will we even live long enough to experience tangible evolution? And if we do evolve significantly, what form will it take? Looking at that little dorky dog-like creature above, and then at the Blue Whale it’s almost impossible to fathom what we might become if given enough time! What environmental condition or external stimulus will have the biggest impact on our evolution? Will we develop a 6th finger on each hand to help us type faster? Will evolution instead take the form of transhumanism: bionic arms and eyes, and cybernetic implants? The problem is, evolution is slow. You can forget ruggedised skin to survive global warming (or impending ice age if you’re that way inclined). You can forget wings to fly around with (though that might happen if we move to a planet with less gravity!) In fact… I really have no idea what we might evolve into. It’s like being asked ‘what do you think the world will be like in 100 years?‘ but exponentially more difficult to answer. Looking at history we’re actually more likely to wiped out by a meteor before we evolve into something new and exciting. With us obliterated, the whales might sneak back onto land and spend another 53 million years transforming back into dogs: speaking dogs with opposable thumbs capable of using tools. The thing is, dear, if humans evolved from monkeys and chimpanzees… why are there still monkeys and chimpanzees? That is the flaw in saying that we evolved from the animal kingdom…. As much as I love your writing Mr Seb and think that crazy little dog thing is way cool for turning into a whale….. you’ve left no room for God in there… squeeze him in somewhere will you? Oh wait, no I’m not. I like whales. I agree with Pinkjellybaby – you are not welcome in the South, Midwest, and large sections of CA (Fresno for example, but who wants to go there?) and all of Utah has banned you. You can come to LA, SF, and Berkley though. We’re pretty down with evolution. And even if we’re not we’ve been told to be “tolerant” of the heathens like you. I think that transhumanism is a definite option, particularly in the first world. I think with medical care reachign the stage that it has we’ve basicaly limited the influence of evolution on humans. Not so in the developing world where there is resistance to AIDS and malaria (among other things), but we all feel that we’re better because we treat congenital diseases so that those traits are becoming increasingly prevalent in our society. And for the record, i believe in God AND in evolution. I really don’t see why they can’t both be true. Let me go and find my anti-lightning helmet now! Re: why there are still monkeys and chimpanzees — I’m not an evolutionary expert, but I believe the logic is that we moved onto the Savannah of Africa, while our primate friends stayed under the canopy of the trees. The same way that blue whales split away from the tree 30 million years ago, but dolphins didn’t pop up until 20 million years ago. Evolution is all about external factors — if some monkeys stayed in the jungle they would never have to use tools, never have to develop opposing thumbs… and thus never develop into the humans we are today. Helen has a good point: With our medical activities as they are, we may be improving individuals’ lives, but we’re encouraging the evolution of bad traits! Look at peanut allergies — do we really want our species including the ability to drop dead if you drink from a can that was touched by a hand that touched a peanut two hours ago?? (I realize this is incredibly heartless to people who have peanut allergies, and I even have a very lovely aunt who has every allergy you can come up with; I’m speaking strictly genetically here.) If I knew I had some terrible genetic condition I would adopt rather than reproduce and pass it on! If you follow the repercussions of our current medical practices, the future of first-world humanity is fat, diabetic, veeery old, and allergic to everything that looks at it sideways. And probably bionically enhanced, for supplemental awesomeness. Something useful we are evolving: More than 20% of humans are not growing full sets of wisdom teeth anymore! People are commonly found to be “missing” at least one, and can decline to grow the whole set. And how recently was it that we stopped needing a few extra molars? Cooool! We’ll also all be short-sighted. And brown-haired! And, I assume, we’ll also be more stupid. Back in the olden days, if you messed up, you died — nowadays, you can get away with shocking displays of stupidity. Helen: won’t we be able to treat congenital diseases with DNA meddlin’? Re: God, you can always allow for Him/it to have given some of the monkeys the urge to climb down out of the trees. Why not? My biggest issue with the anti-evolution people is that they disagree with it on principle, rather than taking a trip to the local library and trying to find out why they think it’s so terrible before they start going on about it. Yes, but WHICH of the gods? The monkey god? The monkey god of vines? The chimpanzee god of fortuitous food? Did monkeys have the Christian God or the Islamic God? Aren’t they both the same? Gahhh! We’re already evolving, in small ways. Because we’re not all born with appendixes anymore or all of our wisdom teeth. Because people are born with immunities to certain diseases and weaknesses to other. The only shame is that modern health care won’t ever let us truly evolve, since it nixes the ides of survival of the fittest. In order for us to truly change as a species (in a purely biological sense), our weak would have to die off and our strong would have to be the only ones breeding. Don’t get me wrong, I LOVE health care. But we’ve been messing with evolution more in this century than any of the millions of years before. Haha I just scrolled up and read Melissa’s comment. I guess she beat me to it! Did chimpanzees use their appendix? It’s for digesting grass and stuff right…? If I soak in my bath tub for most of Sunday, will I evolve in to a Whale? Or will I be punished by god for playing with myself in the tub, on Sunday, the day of rest, and turned in to a Whale? In theory we could turn into whales, but we have to be forced from the land for a reason. The pakicetids (and I assume reptiles also) were forced out by the large carnivorous dinosaurs. Then a meteor landed, killed all the dinosaurs and left the mammals to rule supreme. And the whales have been laughing ever since. I’d like to think we’d evolve to make better use of tools. Perhaps some telekinetic energy? Helen, remind me to head to the library when I get back to the States. I have some beefs with Evolution, but frankly haven’t studied it enough to eloquently make my case. A big piece for me is that Evolution doesn’t adequately give reason for the beginning of life. As I stated on another blog de Seb thread, I can’t much make the “Big Bang” compute for me. I feel as though evolutionist throw around “millions of years” like theists throw around “faith”. Then again, that’s my uneducated presumption. I do intend on changing that, and Helen, I do agree with you that if “Intelligent Designists” don’t have a clue about Evolution, they probably shouldn’t make much of a stink about it. I hope ya’ll don’t find me too stinky. I am due for a shower. Nicely put Chase! I think you’re ok for now! I think Evolution works around a few basic principles, the rest is just fluff that is being reworked and retested and retaught a lot. Faith is pretty similar (we have the Creed and the central concept of death and resurrection), everything else changes dramatically according to denomination, translation, what the preacher ate for breakfast… but we’ve been taught from a really young age that questioning Faith (with a captical F) is just plain not allowed. And whatever you are taught, well that’s the way it is. I think that people can believe whatever they want to, as long as they never stop asking questions. And the people who feel that their Faith is being attacked, fine, but bear in mind that Scientist attack other scientists just as much. It’s all part of the process. Not that the sciency-folk aren’t in need of a shower at times as well! I’m actually in the middle of replying to the DEATH comment thread, but I’ve been feeling a little out of sorts and unable to put words together quite so eloquently as usual, so it’s harder work than normal…! I think there’s certainly space for some divine intervention, somewhere. But I hope people don’t still claim that the world was called into existence only 6000 years ago…? The ‘knowing’ comes from tell-tale signs — whales, for example, have vestigial legs! Not formed, and under their blubber, but they still have the bones that would have been little doggy legs 53 million years ago. If you’re talking about the dating (as in carbon dating), that’s pretty darn scientific. I kinda like what they had to say. BTW: RE “and whatever the preacher had for breakfast” …LOL! Seb, eloquence disabled? I never thought such a conundrum could come to be! I’m sure it will pass soon. And also am looking forward to a properly penned post on evolution. Much more eloquent than any endeavor I could set out on (certainly this side of my library trip). I feel sorry for those chimps that stayed chimps while we became something else. Hell, I haven´t thought about this stuff at all to say anything profound. Maybe some day. I would just like to say that I love whales. They are good. I’m always satisfied by you. That came out much more sexual sounding than was intended. Looks like sharks are now going the same way as the whales. In a few short years this whole debate will be mute as there will not be any whales or sharks left. 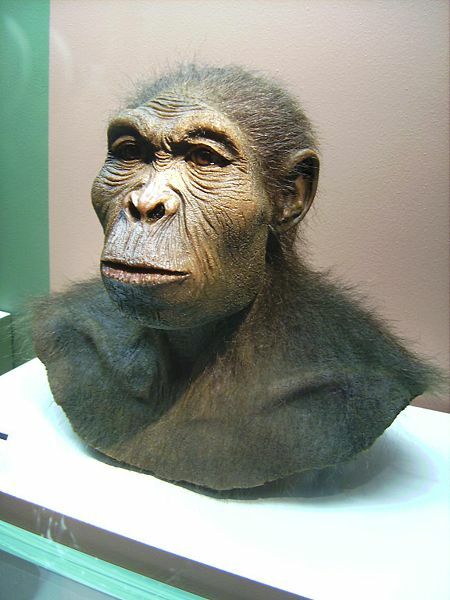 The reason why Chimpanzee’s and other primates are still around today is because us Homo sapians and our cousins the Chimps evolved from the same common ancestor as each other, we did NOT evolve from Chimps, which is the common misconception people have of evolution !